In medium bowl, stir Bisquick mix, milk, 3 tablespoons sugar, lemon peel, and the butter until soft dough forms. On ungreased cookie sheet, drop dough by spoonfuls to make 6 shortcakes. Sprinkle sugar over tops using 2 tablespoons sugar. Meanwhile, in 1 quart saucepan, combine sugar and water. Cook over medium heat until sugar is dissolved, stirring occasionally. Remove from heat, stir in blackberries. Split warm shortcakes; fill with blackberries and syrup. 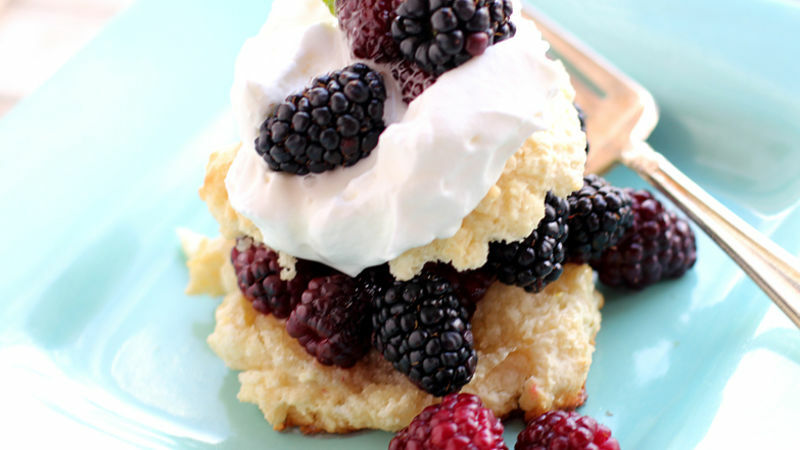 Cover with top halves of shortcakes; dollop with whipped cream and additional blackberries. Make it your way! Use your favorite berries. While known for making great pancakes, Bisquick can also be used for many quick and delicious desserts that look like they took hours to prepare. Watch this video for Blackberry Shortcake and then let us know if you like this recipe and would make it. Blogger Brooke McLay knows how precious time can be, especially when you have a family. Creator of her blog, cheekykitchen.com, she makes fast and easy recipes that look — and taste — like they took hours to prepare. That's exactly why the Bisquick team thought she'd be the perfect person to show you how to make this deliciously simple Blackberry Shortcake. In medium bowl, stir Bisquick mix, milk, sugar, lemon peel, and the butter until soft dough forms. On an ungreased cookie sheet, drop dough by spoonfuls and sprinkle sugar over tops. Bake 10 to 12 minutes or until golden brown. Meanwhile, in a saucepan, combine sugar and water. Cook over medium heat until sugar is dissolved, stirring occasionally. Remove from heat, stir in blackberries. Split warm shortcakes; fill with blackberries and syrup. Cover with top halves of shortcakes; dollop with whipped cream and additional blackberries — and you're done! A beautiful dessert that really hits the sweet spot.